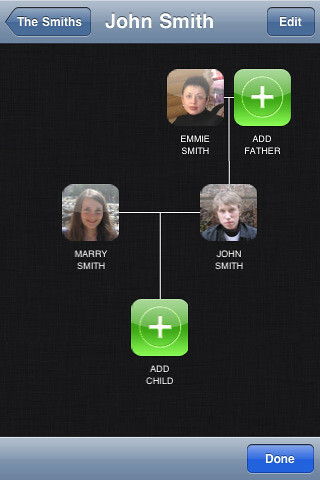 Family Trees for iPhone, iPod touch, and iPad has been released. Family Trees is a new iOS-based genealogy application that is independent of any desktop applications and does not need to be online. It does require iOS 4.0 or later. Not a lot of information is available about it just yet – it popped up early on the iTunes / App Store this morning. It has an interesting story telling feature – it will assemble a biography from facts/events entered into the individual entries. * iPhone, iPod touch, or iPad. * iOS 4.0 or later. You can purchase it for $1.99 at the Apple iTunes App Store. It’s available in the US and possibly elsewhere.